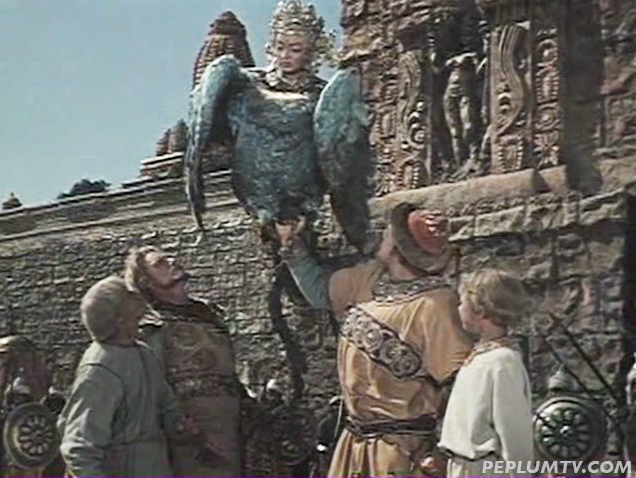 This gorgeous 1953 Russian film was acquired by US distributors, reedited and renamed as THE MAGIC WORLD OF SINBAD (1962). Though the acting is a bit mannered and theatrical, the look of the film is stunning, even when watching it in 2017. The US version is funny because it simply doesn't look like Sinbad (a blond Sinbad?) but that's how it was sold to kids back in the 1960s. I tried to do a Fan Dub of this, using the US English dub track and editing it to the Russian copy but there are so many cuts and scenes re-arranged that I've abandoned it. I do have a Fan Sub of it and might upload it to Youtube, if there are no copyright issues. The film has many singing moments. I have this one plus a bunch of other Russian fairy tale movies (of which I'm a big fan), all from the 1950's and 60's. They all look absolutely amazing, and it's a sad thing indeed that they've all been pretty mangled in US distribution versions. But never mind; the originals are all on pristine European DVD editions now. I bought them all from the Russian Film Institue many years ago, and charmingly enough, they arrived in my mailbox wrapped in old-fashioned brown paper with an equally old-fashioned parcel string holding the package together! I'm watching it right now and it's such a charming film. I haven't finished it yet, but I'm worried about what the sea princess will do when she finds out that the hero actually loves his real girlfriend back in the big city way more. I have this with my Amazon Prime. The movie is in Russian, but the story is quite good and the print they used is very exceptional. I remember the US version from when I saw it growing up and I can say that there is a huge difference. FUN MOVIE! !